Do you love nothing more than spending your weekends getting stuck into some DIY? Or perhaps you're a trader using tools in your everyday life? Whatever you're looking for, a Tooled-up.com voucher is a great way to make massive savings on a wide range of tools of all shapes and sizes. So whether you're a professional or a home enthusiast, Tooled-up.com vouchers will save you money while you shop. Tooled-up.com started life as Lee Industrial way back in 1976, a British firm offering the very best quality tools at the best possible prices. With the launch of Tooled-up.com in 2000, the company has gone from strength to strength, combining their years of experience in the tool industry with a huge range, competitive prices and excellent service to offer customers a fantastic shopping experience. Over the years, Tooled-up.com has built up strong relationships with all the major tool brands and suppliers, allowing them to offer great deals to their customers along with the reassurance that they are ordering a quality product. And because all of their stock is held in a dedicated warehouse, they can provide a quick turnaround on all orders – great if you urgently need a tool at the last minute for a specific job. At Tooled-up.com, they cater for everyone, whether you're a seasoned professional looking for the right tools for the job or an ethusiastic amateur wanting to build up your collection. Their website boasts an incredible selection of over 60,000 tools, all available to browse by category or by job – so it's easy to find exactly what you're looking for. Searching for electricians tools? Whether you need them for work or just a project around the home, Tooled-up.com has a fantastic collection for you to choose from. Or perhaps you're looking for the best deals on sealants, fillers, adhesives and more? You'll find all the top products from all the top brands – all at affordable prices. As well as a great range of tools, Tooled-up.com stocks bike and motorcycle accessories, household and hardware products, camping and outdoor accessories and much more. They've even got a selection of hardy, durable workwear that's great for keeping you comfortable and grime-free while hard at work. And if you're ever unsure which product to choose, the team have years of tool industry experience – and they'll be more than happy to guide you in the right direction. Want to get shopping with Tooled-up.com? With a Tooled-up.com voucher you can enjoy fantastic savings on their wide range of tools, accessories and more. So whether you're getting to work on that new kitchen or perhaps setting up a business venture, a Tooled-up.com voucher code will help you save the pennies. Over 60000 tools from top manufacturers at affordable prices. Browse our website until you find a Tooled-up.com discount code that suits you, then navigate to their website to begin shopping. When you're finished shopping, click 'Continue to checkout'. Enter your details and click 'Create account'. Enter your delivery details and click 'Delivery and payment'. Enter your Tooled-up.com voucher codes where applicable. Want to find out more about the best tools at the best prices with Tooled-up.com? Why not pay a visit to the company's dedicated YouTube channel here? You'll find lots of exclusive content including product reviews, instructional videos, DIY tips and more. You can also use this channel to find out more about saving money with Tooled-up.com discount vouchers. If you've enjoyed shopping with Tooled-up.com, you might also like to check out more great deals on DIY supplies and more at stores like Homebase and B&Q. Or, if those aren't right for you, you'll find plenty more deals to browse in our Home and Garden section. Enter your Tooled-up.com voucher where applicable. Enter your payment details and click 'Place my order' to complete your order. Delivery costs vary dependent on the size and weight of your order, with a choice of delivery options available. If you need to return a product for any reason to Tooled-up.com, you can do so by simply returning your items in their original condition within 30 days of receipt. Need to speak to the team at Tooled-up? Whether you have a question about your order, want some expert advice on choosing the right tools or just want to find out how you could make big savings with a Tooled-up.com voucher code, you can contact the Customer Services department by telephoning 0844 335 3902. Want to discover more from Tooled-up.com? Why not follow them across your favourite social media platforms? You'll enjoy access to lots of interesting content including competitions, special offers and more. You can also use these pages to find out more about saving money with Tooled-up.com vouchers. Don’t forget to check them regularly, as you can never be sure when a free Tooled-up.com voucher might be waiting for you! Buy now online at www.tooled-up.com. My husband loves pottering around doing DIY, and I wanted to get him a new set of tools for his birthday. With the Tooled-up.com voucher I found online, I got a great deal. 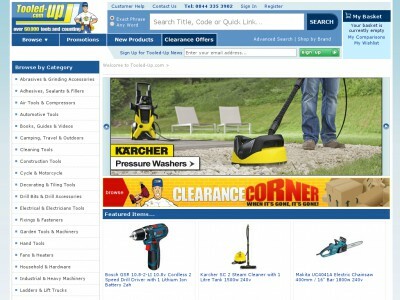 At tooled-up.com they stock over 60,000 different tools – all available at a discount with Tooled-up.com vouchers. I used my Tooled-up.com voucher code to splash out on a new electrical drill complete with accessories – and saved enough for some extras too. So why not see what you could save with Tooled-up.com voucher.